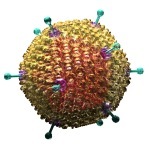 ADENOVIRUS & OBESITY IMAGES: the Adenovirus 36 (Ad-36) has been linked to obesity, suggesting an infectious component to the obesity epidemic. VIRUSES AND OBESITY: The interesting thing about Ad-36 (and also Ad-37) - see images along top of page - is that they have been implicated in the human obesity epidemic. In some studies those who had a high BMI (Body Mass Index) were five times more likely to have antibodies to Ad-36 than those who were not obese. 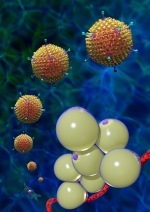 The increased adiposity seems to be seen along with a decrease in blood levels of triglycerides and cholesterol. These viruses seem to target preadipocytes (or early lipoblasts) causing increased differentiation and fat storage. TRY OUR NEW BODY MASS INDEX CALCULATOR! 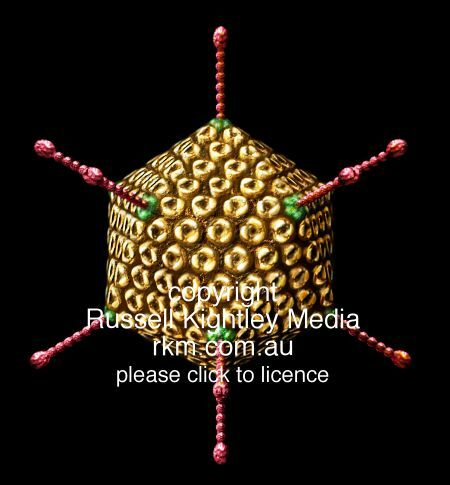 Adenovirus is a naked icosahedral virus that contains a double stranded DNA genome. 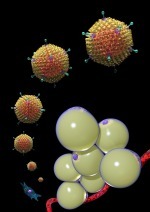 From each vertex, there projects a fibre (red) whose blob like end attaches to host cells.